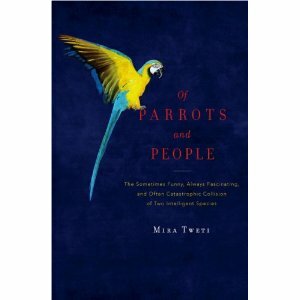 In keeping with this month’s topic of conservation: “Of Parrots And People” by Mira Tweti is a must read for anyone concerned with the preservation of our beloved parrots. Though not a “warm-fuzzy” read, it is an educational eye-opener. Ms. Tweti covers everything from parrots in our homes, cared for and loved, to the smuggling business, the pillaging of the eco-system, bird mills, shady pet store practices, and the politics behind much of this. Of the known 9,700 species of birds, 340 are parrots. Of the 165 bird species listed on CITES Appendix I, 51 are parrots. So 30 percent of all Appendix I birds are parrots. One might think that domestic breeding could be the answer but in many cases this poses its own problems. Bird mills can produce thousands of parrots at a time which in turn are sold to low overhead, understaffed pet or pet supply stores. Syringe feeding is done by a rotating staff of low wage, under-trained workers and sold as “hand raised.” What the unsuspecting buyer is getting is an emotionally deprived parrot whose most intimate contact has been a plastic syringe. Ms. Tweti also uncovered practices in pet stores where instead of taking sick or injured animals to the vet, it was “cheaper” to put them in the store’s freezer until they died. Deforestation is another problem. To feed our huge appetites for wood, cheap fast food hamburgers, and paper products, guess who suffers, the parrots who lose their habitat and food sources. It takes 90 years to grow a box of kleenex. In 2003 Kimberly-Clark produced 1.3 million tons of tissue and toilet paper, 30 percent coming from virgin pulp from ancient boreal trees. And pound for pound, parrots are worth more on the black market then cocaine. Ms. Tweti goes on to say because we consume way more then other countries, our ecological footprint is twenty to thirty acres – that is how much agricultural land one American uses for food, clothing and daily essentials, and disposal of waste products. In closing she writes “Parrots are the canaries in the coal mine of the present day ecological crisis. When you follow the parrot trail – from the relentless hunting that is decimating populations in the wild, to rampant deforestation that is clearing their natural habitats – it leads to the decline and destruction not only of these treasured species but of other species still unknown to us, and eventually to our systemic destruction of the planet as we know it”. This excellent book is filled with facts we all, as responsible parrot owners, need to be aware of, painful as they may be.